A cruise on the Danube River takes you through lush vineyards, castles, and some of Europe's most culturally rich cities. Extending from southern Germany's Black Forest and 1,777 miles later emptying into the Black Sea, the Danube River is the second-longest river in Europe meandering through or bordering 10 countries including Germany, Austria, Slovakia, Hungary, Croatia, Serbia, Bulgaria, Romania, Ukraine and Moldava. A cruise on any of the riverboats that sail the Danube acquaints you with a diversity of central and eastern European cultures and landscapes through classic European river port cities like Vienna, Budapest, Passau, Regensberg, Melk and Bratislava. 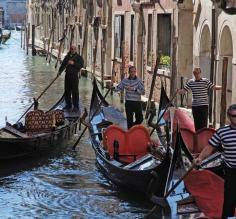 Enjoy wine tasting, bicycling, and walking focused river cruises. Contact one of our Danube River cruise specialists to start planning your dream trip. On this 7-day Danube River cruise from Linz Austria, board MS Modigliani to discover Vienna, Budapest, Bratislava, and Melk. This Danube River cruise showcases the history, culture, art, and traditions of Austria, Hungary and Slovakia before returning to Linz. Enjoy fine wines and French haute cuisine aboard your modern riverboat. This classic Danube River cruise of Eastern Europe starts with two nights in historic and beautiful Budapest, followed by a 7-night cruise from Budapest to Vilshofen aboard the MS AmaMagna, concluding with three nights in cosmopolitan Prague. As you cruise from Hungary to the Czech Republic, you will stop in both Germany and Slovakia. Explore the enchanting cities of Central Europe aboard the MS Vivaldi on this 12-day Danube River cruise visiting Tulcea, Giurgiu, Belgrade, Novisad, Budapest, Bratislava, Vienna, Melk and, Linz. With chances for walking and biking tours, explore museums, fairy tale towns, modern cities, and the art & architecture that characterizes eastern Europe. Sail along the beautiful blue Danube and cross four different countries on this 6-day cruise aboard the MS France. Begin your journey in Germany and sail east through Austria, Slovakia, and Hungary. 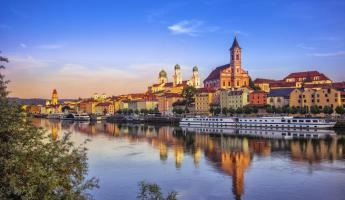 Cruise through stunning landscapes and experience the rich culture, art & history of central Europe, in cities like Passau, Melk, Vienna & Esztergom. 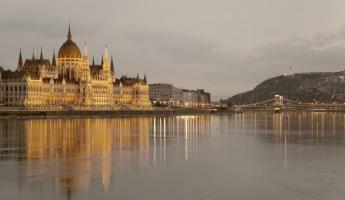 Explore the Danube River on an 8-day cruise from Budapest to Vishofen aboard the MS Amasonata. En route from Hungary to Germany, you will pass through Slovakia and Austria, with opportunities to visit the Melk Abbey, sample the renowned wines of the Wachau Valley, and take part in biking and walking tours of the ancient cities of Eastern Europe. Magnificent Europe - Cruise Only $6999 15 May 8, 2020 Embark the luxurious MS Amaserena for a truly grand cruise from Amsterdam to Budapest through the heart of Europe and across the Continental Divide. MS Amadante 148 $2799 Launched in 2008, the MS Amadante is part of the newest, state-of-the-art fleet of river cruise vessels in Europe. When should I plan my Danube River cruise? Most experts agree that best time to go on a Danube River cruise is during the fall when you'll have best chance for pleasant weather, smaller crowds, and consistent river levels. Spring - March, April, and May - can be rainy. March can be very cool, but by May temperatures are quite pleasant. Snow melt makes the river levels rise so boats can't pass under bridges, so getting rerouted by bus downstream is a risk. Summer - June, July, August - can be hot and crowded, but longer nights let you explore more and see more of the countryside. Fall - September and October - are good for Danube River cruises due to mild weather and less crowding at hot spots. It's best to reserve in advance, as the word is getting out. 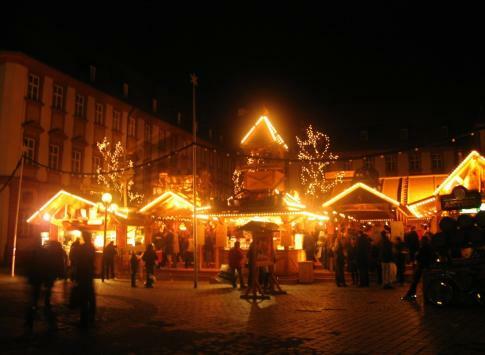 Christmas - in December, we feature a rare opportunity to see the Christmas markets of the Danube River, where the holiday spirit that has characterized the Advent season in central Europe will come to life for you as you witness these fascinating yule-tide markets. 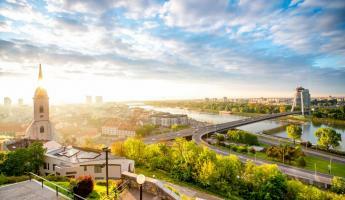 From January through early March, the temperatures along the Danube and throughout Europe fall between cold and frigid, making this a bad time to visit the Danube region. If you want help selecting the best month for you, please contact one of our Danube cruise experts. Experience some of central and eastern Europe's most famous and unique wine regions like Austria's Krems and the Wachau Valley, a UNESCO World Heritage Site on a wine-themed cruise on the Danube such as the Melodies of the Danube on AmaWaterway's Amaviola. Each voyage features one or two wine experts or onboard sommeliers that will host tastings and food-and-wine-pairings of local wines that complement our visits to historic vineyards, wine villages, wineries, and famed wine cellars of the Danube River valley. The Wachau Valley is unique due to its unique man-made stone terraces that enable cultivation of Grüner Veltliner and Riesling varieties on the steep river banks of the Danube. Downriver near Budapest, Hungary, we'll taste exotic Hungarian varieties such as Egri BikaverZierfandler, Cserszegi Fuszeres, and Juhfark. Slovakia, Croatia and Serbia also have local varietals that shouldn't be missed. Is River Cruising Right for Me? European civilization was built around the rivers, so these cruises offer a great way to see the main attractions and sites. It's essentially a floating hotel - unlike bus tours, you will awake every morning in a new destination without having to pack or unpack or deal with uncomfortable overnight buses. Austria: Home to the medieval Schönbrunn & Hofburg Palaces in Vienna, the Baroque-style Melk Abbey, historic Dürnstein village, and some of Europe's legendary wine regions like the Wachau Valley. Germany: The WWII sites of Nuremberg, the architecture of well-preserved medieval Regensburg, biking and hiking around the Baroque & Gothic architecture of 2000-year-old Passau. Hungary: Visit the neo-classic basilica and former Royal Palace in Esztergom or learn the storied history of Unesco World Heritage Site, Budapest. Slovakia's charming capital of Bratislava features castles and cathedrals overllooking the pedestrian-only old town. 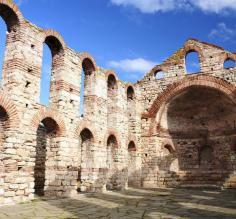 Croatia, Bulgaria, and Serbia are all home to their own historical, cultural, gastronomical and architectural delights. Czech Republic: The sites of Prague, like Rudolfinum National Museum, Wenceslas Square, the Hundertwasser Dancing House, and the 1,000 year-old Prague Castle, just to name a few. Explore historic Prague including Prague Castle and the city's many ornate bridges over the Vltava River. In general, Danube river cruises don't focus on the needs of children, but there are some riverships that cater specifically to children and some cruise lines are open to infants, toddlers and children of any age. AmaWaterway's Amaviola was designed in conjunction with Adventures by Disney specifically with the needs of children and families in mind. Few of the departures during the year are managed by Disney, but the ship and the crew are prepared to create fun-filled voyages for younger passengers. CroisiEurope's fleet of European riverships allow children of all ages including infants, but extras like cribs and high chairs are not provided, so you should consider bringing your own. Contact one of our Danube cruising specialists for help planning the perfect family cruise. Melk, Austria - Ride along the picturesque Danube River between Dürnstein and Melk through one of Austria’s Wachau Valley. 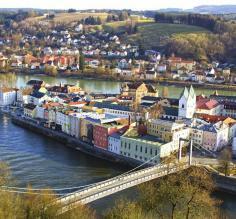 Passau, Germany - take guided bike tour along the Danube from Passau to Erlau passing breathtaking castles & cathedrals. Vienna Austria - ride along the Danube through the Donaupark or the Klosterneuburg Monastery accompanied with tasting Viennese coffee and pastries in a traditional cafe. Linz, Austria take a guided bike tour around the Old City Center, along the Danube River, and past the ultra-modern Ars Electronica Center. Further down the Danube ride through historical bike-friendly cities such as Belgrade, Serbia and Budapest, Hungary. Not counting Russia's Volga River (which is partially in Asia), the Danube is Europe's longest river, at an incredible length of 1800 miles (2,860 km). German warships were sunk to avoid Soviet capture towards the end of WWII, and their remains can still be seen peering through the water in the summer months. The Danube crosses through 10 countries, which helped certain cities like Vienna, Budapest, and Belgrade gain importance in European affairs. Biking and walking trails are very common along the whole river. Home to more than 200 species of fish, it was once a main source of food for the region and before becoming a river cruise destination was primarily a major economic waterway through Europe. Although river cruising on the Danube is not particularly set up for those in a wheelchair or for those with accessibility issues, these riverboats cater to mobility-challenged guests: AmaSerena, AmaSonata, AmaReina, AmaPrima and AmaCerto have specially designed cabins that have slightly wider doors and modified bathrooms that allow wheelchair access. CroisiEurope's MS Vivaldi, MS Beethoven, MS Gérard Schmitter, MS L’Europe, MS Lafayette, and MS Modigliani have elevators and rooms for accessibility challenged guests. It is recommended that you be able to go up or down short flights of stairs in order to make the most of your trip. Most river cruises aren't particularly set up for solo travelers, but an amazing time can be had if traveling alone. Very few riverboats have single rooms and the majority of cruise lines will charge a single supplement fee (usually +50%) in order to occupy a double room onboard. Keep a look out for special deals that waive the single supplement fee on last minute trips and other occasions. If you tend to avoid cruises because the rock and sway of the boat makes you feel nauseous, then a river cruise might be a great alternative - these boats don't really rock too much since they are on a river. If you're still concerned this might be a problem, most people find that packing Dramamine or OTC seasickness medications work well. An alternative might be the pressure point motion sickness wrist bands. Expect your meals to be served buffet style for breakfast and lunch and sit-down style for dinner. Make sure you are arriving at the times indicated on your itinerary. Unlike bigger cruise ships where meal time is flexible, on river cruises you are expected to be punctual as each meal will only be served during the indicated hours. When cruising the Danube River with Adventure Life, you will either enjoy the comfortable economy of CroisiEurope or the luxurious appointments and service of AmaWaterways. Either way, our hand-chosen itineraries aboard their vessels are guaranteed to offer you an unforgettably wonderful experience as you travel through Europe. AmaWaterways offers guests all-inclusive itineraries with all gourmet meals served onboard in one of the multiple dining areas. There are a variety of social areas that guests enjoy, including a panoramic sundeck that hosts a walking track and heated pool, a spa and massage parlor, a fitness center, and of course several spacious lounges and bars. Another major draw of AmaWaterways are their active but not overwhelming itineraries, typically offering at least one activity in each port and also allowing travelers to enjoy a bit of independent exploration on their own time. Their Danube River vessels are: the MS Amacerto, MS Amamagna, MS Amaprima, MS Amaserena, MS Amasonata, MS Amastella, MS Amaviola, MS Amasiena, MS Amalea, and MS Amadante. CroisiEurope has been around for over 40 years, but their competitively low cruise prices compared to the other operators has made them an excellent option for travelers hoping to experience Europe on a bit of a tighter budget. Although there is usually just one dining area on each vessel and there are fewer elegant amenities or social spaces, guests find the cabins comfortable and the food nourishing. There are also fewer activity options in each port. Their Danube River vessels are: the MS France, MS L'Europe, MS Symphonie, MS Vivaldi, MS Victor Hugo, MS Beethoven, and MS Modigliani. Explore all of these ships here. The Danube River flows from Germany through some of the most historic regions of Central and Eastern Europe, including Austria, Slovakia, Hungary, Serbia, Romania, and Bulgaria. Since most of our cruises visit the popular destinations throughout central Europe, the majority of the Danube River cruises only go as far as Slovakia & Hungary. You will likely visit towns like Budapest, Bratislava, Vienna, Melk, Passau, Nuremburg, and other German towns. If your cruise connects to the Main or Rhine Rivers, you might also make your way all the way to Amsterdam in the Netherlands. Danube River cruises average 8 days, which most travelers find to be the perfect length. There are longer Danube River cruises that range in length from 11-15 days. On these trips, you will likely navigate a large portion of the Danube, from the Netherlands through Germany, and into the eastern European countries of Austria, Hungary, and Slovakia. Shorter itineraries tend to stay in one or two countries. The vessels we have hand-selected for the Danube River cruises were specifically designed to explore Eastern and Central Europe. Their length, comfort, and style reflect classic riverboat design. All of the vessels feature a panoramic sun deck, a lounge and bar, elegant dining rooms, and comfortable air-conditioned rooms. Several of the Danube River boats, including the Amastella, Amaserena, Amasonata, and Amacerto, have an onboard pool. Others feature massage spas and salons. Contact us if you need guidance in selecting the best boat for you. Danube River tours offer all kinds of activities for travelers of all interests. Wine tasting tours are very popular, visiting local vineyards and sampling the regional vintages and unique local cuisine. Hiking and biking in the rolling hills and verdant valleys are active ways to explore the Danube region. And urban exploration and historic tours of the ancient city centers and architecture fill out any central/ eastern Europe itinerary. 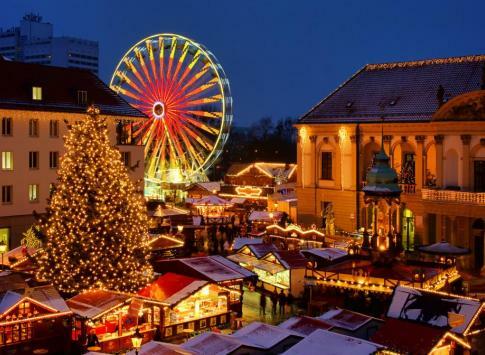 If you travel during the Christmas season, you will see and experience the treasured Danube River Christmas Markets, which bring centuries of tradition and craftsmanship to life in vibrant artisan markets. If you choose to take a Danube River cruise, you will have an all-access pass to some of the greatest destinations in central and eastern Europe, including all tours, meals, lodging, and transportation on a comfortable river vessel. 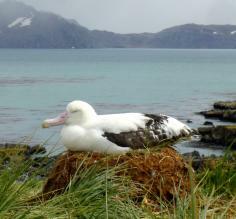 They take advantage of the down time to make the long journeys, like during meal times or at night. Each day when you wake up, you'll be in a brand new destination, without ever having to pack & unpack your bags. Due to space constrictions of Danube riverboats, riverboats generally don't have a lot of amenities like multiple dining areas or casinos, but you can expect to have a spacious sun deck from which to view the amazing sites of central & eastern Europe, a large dining room & bar where you can enjoy the gourmet cuisine, and a pool, spa, or fitness center on the finer vessels. The cabins range from comfortable to luxurious, and you will find that the captain and crew are very friendly and welcoming. What should I expect on a Danube River cruise? I've been on ocean cruises -aren't river cruises pretty much the same thing? Not at all. Not only are there fewer passengers which guarantees a comfortable on board atmosphere with your shipmates, but the boom in river cruises in the last decade has taken the quality, comfort, and design of the cruises to the next level. You shouldn't expect a lot of nightlife or on board entertainment. Not only are the ships smaller and have fewer entertainment areas on board, but the cruise atmosphere is quite distinct as well. Your vessel might have an evening DJ or pianist, but usually not much more. Smaller group size means faster embarking and disembarking at each site and shorter lines. Nightly briefings will give you a peek at the next day's activities and some interesting info about what you will see and experience. How many days should I cruise on the Danube? Danube River cruise itineraries range from 6 to 20 days in length, and the most popular itineraries are 7 or 8-days. Are there 5-star riverboats in Europe? Whereas seafaring ships have the luxury of spacious deckplans, riverboats on the Danube follow a stricter design with three to four long decks, one dining room, lounge, and bar, and a sun deck on the top level. Because their space is limited and they feature necessarily fewer social areas and amenities, they aren't considered five star vessels. However, this is a quickly advancing business in Europe, so it's likely that within the next few years there will be five-star river vessels, as we already feature a fair number of vessels that are truly luxurious. The Danube River can be appreciated in its full beauty from the panoramic sundeck, so balconies don't generally improve the overall experience that much – they will cost hundreds of dollars more and could cost you valuable floor space in cabins that are already smaller than typical cabins on larger ships. A room with a floor to ceiling window or a window that opens can be almost as good on a riverboat. All of our featured boats will treat you to some of the finest local delicacies and comfort food, all in the decadent dining rooms/ bars of the vessels. Excellent chefs guarantee a wonderful menu. Ask about our wine themed cruises down the Danube for insight into the top regions, varieties and unique viniculture on the steep river banks. Yes, on most trips. While many of the Danube visitor sites are right on the shores of the river, there are also a fair number that are a bit more isolated. To get to these destinations, you will just take a bus from the river vessel, but this is included in the price. Some cruises may offer optional excursions that have an additional cost. Will my riverboat have WiFi? Most but not all Danube River boats have WiFi. Most boats have free WiFi, others charge, and some have reception only on deck and not in the rooms. It's important to check with your Adventure Life representative to confirm that your river boat of choice has WiFi. All of Europe uses 220v power, different from 110v power in North America, but fortunately most devices can handle both voltages so you probably won't need a 220v to 110v power converter. You will need plug adapters to convert the two flat prong American style plugs to the two round prong European style. Save thousands of dollars on your cruise by checking out the latest promotions for your destination on our Danube River Cruise Deals page or by letting one of our travel experts help you find the best deals. Don't look to save money by getting cheaper rooms since the lower class cabins are sometimes less comfortable or simply have less space. Most (if not all) river cruise vessels ban smoking anywhere inside the boat, including your cabin. Many vessels allow you to smoke in designated areas of the sun deck. Note that there are also smoking restrictions in certain parts of towns and visitor sites. Are Danube river cruises a good family vacation? The Danube river is a wonderful destination for families of all ages, but the best cruises for families with children or teens are the active cruises that offer biking and walking tours. Check out our family travel article for more information. Are river cruises good for honeymoons? Relaxing and alone time are hard to come by, as you will likely dine with others and be on the move. Staying in your cabin might mean missing tours. How have river cruises improved recently? more exciting and engaging onshore experiences. How Should I Tip On River Cruises? If you've been reading about river cruising, you may have come across the word "rafting", but what on earth does it mean? When certain smaller ports receive more vessels than there are docks, the vessels will line up next to each other and "raft." Passengers will then cross other ships to board and de-board. Don't worry - this is normal and you shouldn't feel uncomfortable. Just make sure to glance out your window to make sure there aren't any ships beside you before throwing open the curtains in the morning in your birthday suit! Do Americans and Canadians need a passport and visa to travel to the Danube? What should I pack and dress for the cruise? Pack to be comfortable for walking in the season you are traveling. Pack one nice outfit for an upscale dinner, usually the last night of your cruise. Otherwise, you can expect casual attire to be appropriate for the cruise. Why go through Adventure Life? 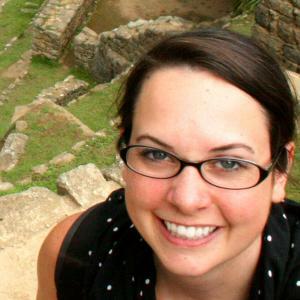 Sure, we know that you can plan a great vacation independently. But any veteran river cruiser will tell you to always work with an agent - the tour operators let us know about exclusive deals. Plus we're here to help you through the whole process. Got a question? We're just a phone call or chat away. 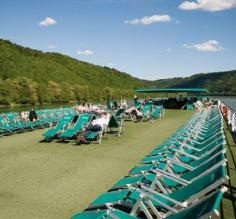 We have hand-selected the most comfortable riverboats that explore the Danube. The average capacity of a riverboat is 160 passengers, with some smaller vessels having an occupancy as low as 100 and some that are around 200 passengers. Every boat features multiple social areas, exquisite food, and friendly crews & guides. Bigger riverboats might have more common areas on board, so if having a pool, dance floor, or exercise room is important, then shy away from the smaller boats. The biggest factor in choosing your boat is the itinerary - each boat sails certain routes, so knowing which cruise you'd like to take will make your boat choice much easier. Contact us if you need guidance in selecting the best boat for you. If you want a very upscale room, consider the suites. Just beware that you will pay a premium for these rooms. What is it like aboard a riverboat on the Danube? On the outside, you'll notice that riverboats strike a contrast with traditional ocean-going cruise ships. Most notably, they are very long, frequently over 100 meters (300 feet), and low having only two or three decks in order to fit under low bridges. While not particularly spacious, riverboat cabins are comfortable. All of our featured riverboats offer luxury or first-class accommodations, and most have a big lounge, an open-air sundeck, a restaurant/ dining room area, and some even have pools and hot tubs. Days will be spent visiting ports of call, exploring quaint villages and castles, bicycling, wine tasting or cruising along the scenic Danube. 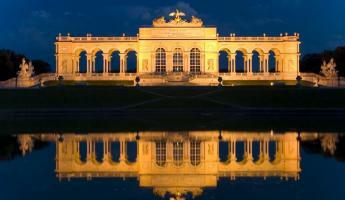 Evenings may include concerts and waltzes on the boat and in major cities like Vienna. Most nights are spent in transit to the next spectacular port. From the fascinating fire dances to the many traditional folkloric festivals and celebrations like Pirin Sings and Rozhen Sings, this ancient country has a distinct character that will delight you as you travel through Bulgaria. Explore the shores of the Danube River searching for wildlife on a cruise through Bulgaria. The unique cuisine of Bulgaria is a savory mix of spicy flavors and distinctly Eastern European dishes, like kebabcheta (small, spicy, minced meat rolls), Yran (a beverage of yogurt and water) and rich liquors and beers. Much like the rest of Europe, Bulgaria has four seasons – summers are warm and sunny, while winters can be bitter cold and very snowy. Autumn and spring are a great chance to see the country in transition.